Who run the world? CATS! 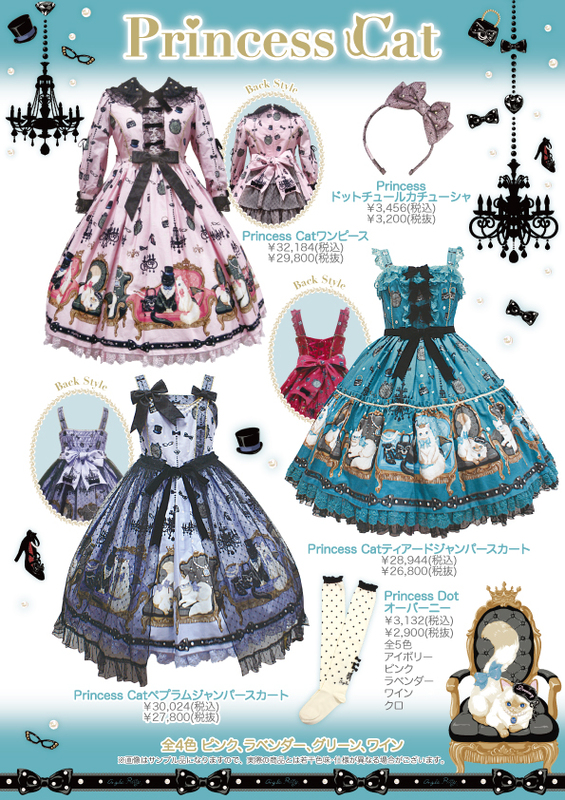 Angelic Pretty is now releasing their new print Princess Cat! As I said in my initial reaction this is a print with cats in tophats, this is great. These cats be stylin'. I love the whimsy of this print, its quite refreshing. The dark turquoise color might be hard to coord if you have a sweet pastel wardrobe, but really at least its easier to coord than the "mint" Diner Doll (omg is it blue or is it mint? cause it matches with neither of those colors). With the general aesthetics and colorways of the pink and lavender it reminds me of a crossover between dolly cat and cinema doll. The OP looks really classy and I like the design of the back a lot! I still don't get the sheer overlay, but its looks highly optional so I guess it's fine. The tiered jsk is the standout for me, I actually really like the design, the tiers make since for this print and actually accentuates it (unlike the tiers on Romantic Little Garden). I love the double layered trim in the bottom, the black layer really balances out the black ribbons on the bodice. I like all the colorways accept for the red one, I would love the jsk in any of the other three colors!